A stunningly efficient hunter, the chameleon relies on an impressive biological arsenal that includes colour-changing camouflage, panoramic vision, and lots of patience. And then there's that lightning-fast tongue. The reptile's tongue-lashing prowess has been extensively researched over the years, but one ability has remained a mystery: how does the chameleon's fleshy projectile hold on to prey while snapping it back towards its mouth at such high speed? Several mechanisms have been proposed: suction, stickiness, or a velcro-like bond between a rough surface on the chameleon's tongue and that of its meal, which can weigh a third as much as the predator itself. On Monday, scientists in Belgium and France said the answer was sticky mucus on the tongue tip. "We were surprised to find that the liquid is very viscous, about 1,000 times more so than (human) saliva," said Pascal Damman of the University of Mons in Belgium, who co-authored a study published in the journal Nature Physics. 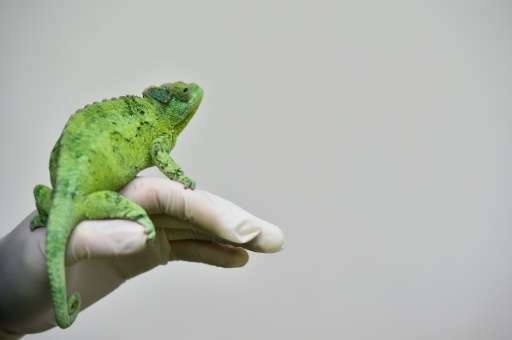 The viscosity, or thickness, of chameleon spit had never before been measured, he told AFP. The team then used mathematics to calculate the adhesive properties, or stickiness, that such viscosity would convey. "Contrary to what many thought, the viscous adhesion is more than sufficient to allow the chameleon to haul in such big prey," said Damman. Sometimes, he added, "the simplest explanation (is) the best one." The chameleon is known as a "sit-and-wait" predator—unlike other reptiles that scramble after their lunch, it stays hidden, motionless, until its prey comes within striking distance. It changes colour to become one with the background. Independently-rotating eyes with a near-360-degree field of vision means the animal doesn't have to move its head while lying in ambush. When a meal makes its appearance, the lizard takes aim and shoots—extending its deadly tongue up to double its body length. But a question remains: How does the creature loosen the catch from its sticky tongue for swallowing? "We can only hypothesise," said Damman. It may use a "normal", non-sticky saliva from elsewhere in the mouth to break the bond. Or it may simply wait for the adhesion to wear off naturally. In viscous adhesion, the stronger and faster the pull of the tongue on the insect, the stronger the bond will be, explained the researcher. As the tongue relaxes, the adhesion will similarly loosen and ultimately disappear, allowing the chameleon to chow down—without biting its tongue.